"This theater company has a rare atmosphere of having high expectations of their performers while cultivating a low stress rehearsal space"
"We Saw "Addams Family" last year and "La Mancha" this year and are so impressed with this young company!" "They do not stay stagnant in their professionalism or artistic capabilities. These directors learn from their mistakes and are not afraid to listen to their actors." "Paraphrase makes you feel valued and important--and they create such an awesome environment for growth and learning!" "It is so great to work with a theater company that genuine cares about each member of their cast and crew. " "Working with this fantastic group is an experience you don't want to miss...fun, innovative, professional...did we say fun?" "Paraphrase Productions has been one of the most important catalysts for growth in my life and I can't wait to see where it is going to go!" "If you have ever felt that you weren't given an opportunity to shine...this is the place to be! You will work very hard but, it will be so rewarding and trust us, you will shine!" "It's a beautiful thing to watch and see everyone's hard work come to fruition in a professional-quality show, and I hope to see many more years of Paraphrase shows!" 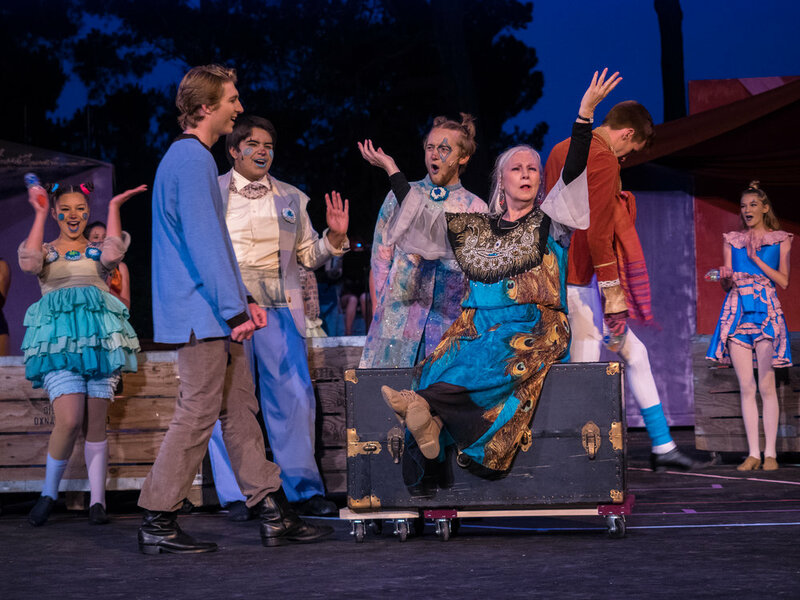 "The fact that the eight performances--4 each of Pippin and La Mancha--were presented to nearly sold out houses speaks volumes about their excellence. " "If they can accomplish all the incredible things they have with the few resources they currently have, they have SUCH great potential to accomplish SO MUCH more given just some more resources." "These two 2017 summer productions-"Man of La Mancha" and "Pippin", well surpass the larger productions we have seen in the LA area." The impact that Paraphrase Productions has in the local community as a place where excellence, friendships, and personal and professional growth happen is clear to see. The Forest Theater Guild is one of Paraphrase's key partners. Because of them, we have been able to perform anually at the famous Outdoor Forest Theater in Carmel. The Forest Theater Guild not only aided us financially and physically, they have helped us learn and grow to be better masters of our craft. The S.T.A.R. Foundation is what brought Paraphrase Productions from idea to reality. Paraphrase Productions partnered with The S.T.A.R Foundation to produce its very first musical: Little Shop of Horrors in the summer of 2015. In addition to their initial support, The S.T.A.R. Foundation has continued to aid Paraphrase in it's growth through grants for ticket subsidies and purchasing various equipment. The S.T.A.R. Foundation also supports a number of our actors through their annual scolarships. Paper Wing Theater Company stands as Paraphrase's first theater. The Paper Wing Theatre Company was generous enough to not only allow us to use their space for Little Shop of Horrors but also to help us finish creating a fantastic premier performance. Our partnership continued with our 2017 Mentorship Program show The Glass Menagerie, performed at Paper Wing Theatre. Paraphrase hopes to continue this relationship in future seasons. The Arts Council for Monterey County is the very first grant organization to support Paraphrase Productions. Their grant for $4,500 has gone toward our 2017 Season. Our success is greatly due to the Arts Council for Monterey County.